Like any art form--preparation and thought go into a well packed bag. If you are or will be a frequent traveler, create a Packing List. Before you pack, create a list of events to be attended, adventure activities, work and evening gatherings requiring professional or evening attire. Once you've selected clothes to wear, remove one outfit. Let's face it; no one wears everything they pack. There's always something that can be cut. Select more tops than trousers or skirts because you can easily wear bottoms twice. Lightweight and durable are the criteria to keep in mind. Unless you're headed to an extended vacation (2 weeks plus), a carry-on will alleviate travel stress and save money. Very few airlines allow a free checked bag. Checking a bag limits options if a flight is cancelled or changed. Invest in wrinkle-free, lightweight clothing with a similar color palette for layering, easy mixing and matching. Place an extra dryer or scented sheet inside your bag to reduce unpleasant odors. Pack sturdy, several collapsible travel bags for purchases. Don't mark yourself as a robbery target. Expensive jewelry, family heirlooms and watches stay home. Rolling your clothes saves space while preventing creases and wrinkles. After rolling, use air-compression plastic bags to vacuum extra air. Efficiently packing the heaviest items (jeans, jackets) at the suitcase bottom. Wrap belts around the edges of the suitcase to cradle clothing. 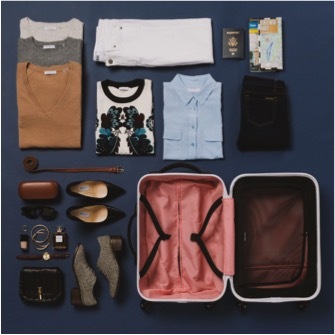 Fill the suitcase with lightest clothing at the top (rolling the entire time). Purchase travel sized toiletries under 3.0 ounces, or use destination amenities. Double-bag all necessary toiletries (liquids, gels) to prevent stains. Place this bag at the very top of your carry-on for quick retrieval at security if you are not TSA-PreCheck. Technology: Organize all gadgets, chargers, and cables in a tech organizer for easy retrieval at security if questions arise. Sharon Schweitzer, J.D. wrote this article with the valuable insights of Clemson University student Shannan Bloomstrand. Sharon is a cross-cultural consultant, an international protocol expert and the founder of Protocol & Etiquette Worldwide. She is accredited in intercultural management, is the resident etiquette expert for CBS KEYE We Are Austin, popular on-air contributor, regularly quoted by BBC Capital, Investor's Business Daily, Fortune, Inc., The New York Times, The Vancouver Sun, and numerous other media. She is the best-selling, international award-winning author of Access to Asia: Your Multicultural Business Guide, named to Kirkus Review's Best Books of 2015. Shannan Bloomstrand is a Summer Intern with Sharon Schweitzer at Protocol & Etiquette Worldwide. She is a senior Language and International Health major with an emphasis in Community Development and a minor in Biology at Clemson University. Feel free to connect with Shannan on LinkedIn or follow her on Twitter @shannanbloom.